Umm.. so this week happened. I really didn't have high hopes for the week because I can read my calendar, but still I'm always shocked when we have a busy week and we aren't as productive in school as I'd like. 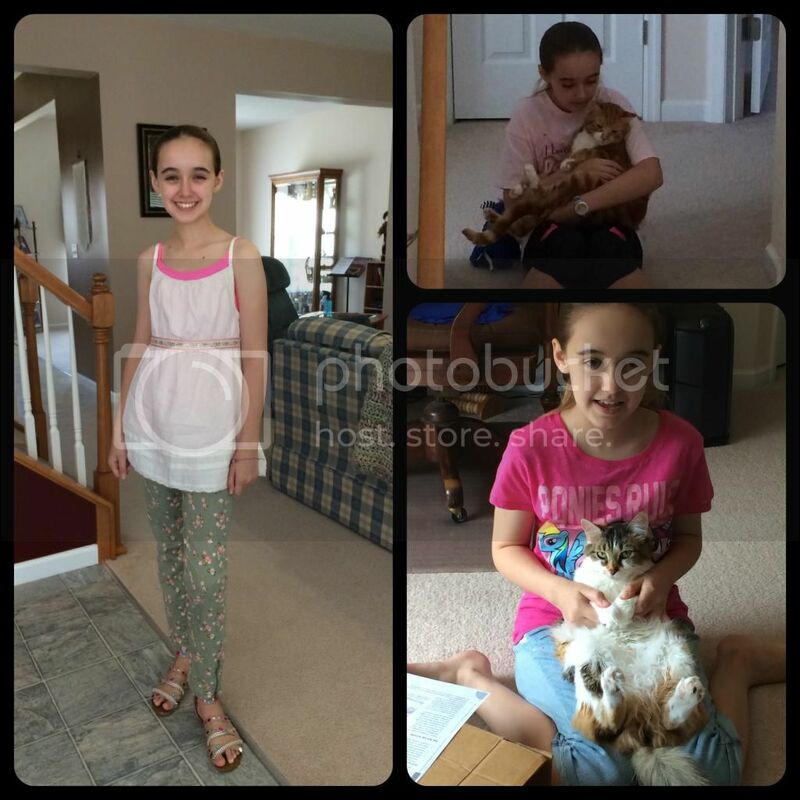 This week included Amber's regular allergy shot, which takes up more time than you'd think, plus dealing with Amber having non-allergic rhinitis all week. We now own stock in Kleenex, or we should. But allergy shot day was our only completely productive day, and that's just sad. 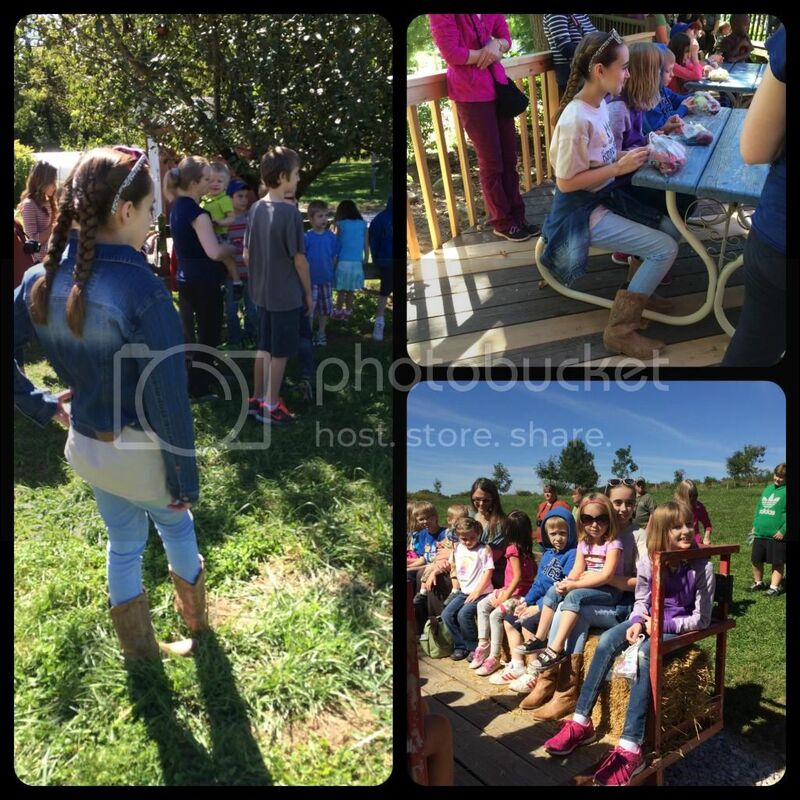 Then there was a homeschool group field trip to a local-ish apple orchard for a hay ride, apple picking, bee keeping lesson and fun. Of course the kids all played on the "playground" at the farm after our tour. Local-ish means that we all pretend it is close and it's in our county still, I think, but it took 45 minutes to get there. Then we had an unexpected recovery day for Amber because the playing after the formal portion of the field trip caused some issues. That child thwarts my every attempt to keep her from having episodes with her heart. "But I was having fun and I wanted to ...." fill in the blank. It's usually run, climb, stand around in the sun, etc. However, the apple picking field trip was an overall bonus because Amber made a new friend in our homeschool group. The new friend doesn't participate in the co-op classes, but will be at many of the other sponsored activities. I'm just so thrilled to see Amber happy with kids her age again and not terrified that everyone will reject her (I personally still have issues to deal with from the last parochial school too). Sadly, recovery day was also flute lesson day and confirmation class, so it was not as calm as one would hope. That's going to be a theme this week. (Left) Co-op outfit this week. That is an American Girl Beforever Caroline inspired top. Amber has always loved American Girl clothes. (Right) Cuddly cats.. sorta. Biscotti (top) was unusually cuddly. Rosetta (bottom) who is usually cuddly was giving me an evil glare for taking the picture. Homeschool co-op class day is always a long day that will be even longer for a while because Fred and I have our foster/adoptive parent class that evening. Amber goes straight from co-op to my mom's house and waits for me to pick her up after what should be her bedtime. So, as expected she was pretty much dead to the world this morning, which should have been a recovery day. But again, she had only a recovery morning. 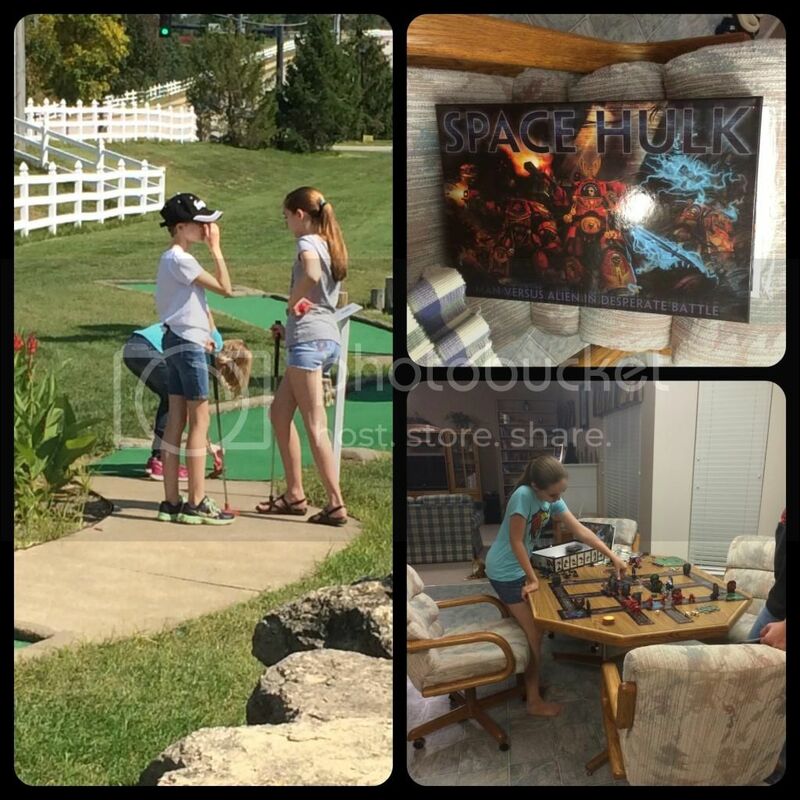 This afternoon was the homeschool group's Teen min-golf activity. Of course Amber won't miss that because she loves all her friends and, well, I'm one of the teen group organizers and this was my activity. Amber is still sniffling and it was warmer than predicted. I tried to encourage Amber to stay in the shade and sit when possible. That didn't happen until she was already past the point of no return and had pushed her heart too far. By then she felt awful and wanted to go home, but guess what? I was the organizer and needed to stay until all the kiddos had been retrieved. Now Amber is a bit of a worn out mess that is resting and pretending that she will have energy for her busy weekend. (Right) Playing Daddy's new game with him.. Daddy is a big Warhammer fan. Did you know that tomorrow the My Little Pony Equestria Girls: Rainbow Rocks movie is out in limited release? Yes, well around here that means one single showing on one single day. Sigh. I preordered tickets for Amber and her friends (and two sad parents that will be stuck in a theater watching MLP). Unfortunately, it's a morning showing so Amber doesn't even get a recovery morning tomorrow... or Sunday for that matter. Not to mention Amber has a friend's birthday party on Sunday afternoon. Besides the single productive day, Amber did manage a subject here or there throughout the week, and confirmation class is built in religion time. But in case you are curious her totals for the week look like this: 3 math lessons, 2 grammar, 2 German, 2 medieval history, 1 science, 1 PE, 1 art (working on the sample project for my co-op class), 1 flute lesson + practice time (hey.. it counts), 1 confirmation class + studying for the test, 4 days of CNN student news, and her co-op classes. (TOP) We aren't big sports fans, but my sister's family is... can you guess who? (Bottom-Left) That's not rain.. or snow. It was the Monarch butterfly migration caught on radar. (Bottom-Right) For my little Pinkie Pie Fan. Next week we are very tentatively signed up for an out of town field trip to Hannibal, MO. I'm pretty sure it won't happen at this point. Amber needs some dedicated time for core subjects and she probably won't have the energy for it anyway. She's already disappointed and I'm the big bad mommy. However, parenting a child with chronic illness means that sometimes you have to make decisions that seem unfair to keep your child functioning. Amber simply does not like giving up so much control over all facets of her life, and I don't blame her. Next week we are going lower key and getting this child some rest and hopefully a whole bunch of school work completed too! I would be disappointed if I missed a trip to Hannibal, too! :( That is definitely on our bucket list! 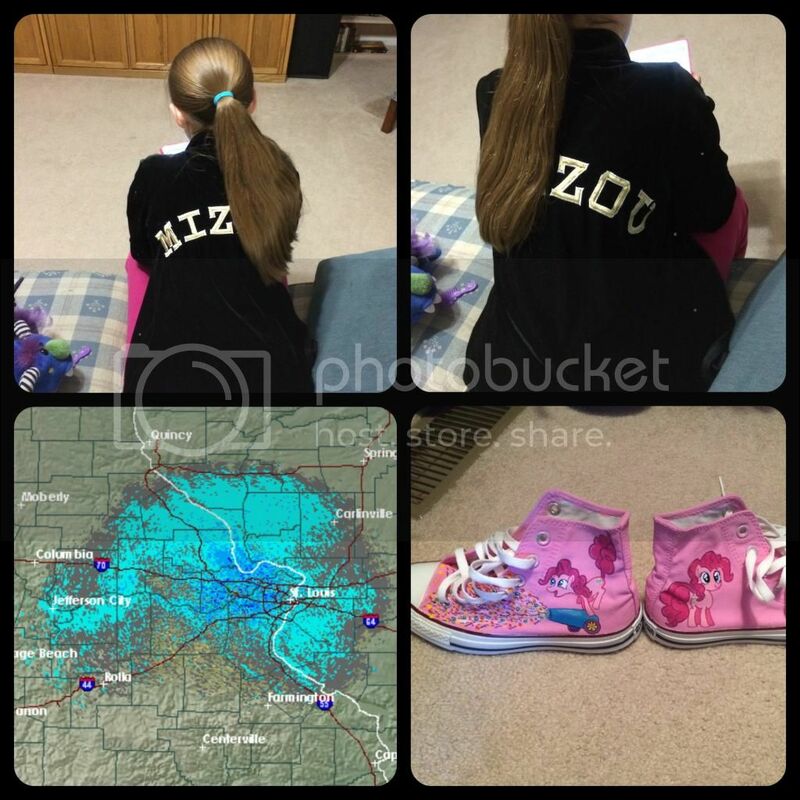 MIZ .... ZOU!!! Parenting isn't a popularity contest! Still, it is no fun being mean mommy. I think you all had a great week with plenty of learning. I'm not a popular parent right now, not at all. Between making her rest, cancelling the Hannibal trip, making her practice flute, and encouraging her to do her required sermon report today at church I'm pretty much not the person she wants to see right now. That is a cool radar image of the Monarch Butterflies. I saw one years ago of millions of bats near San Antonio,TX. Butterflies sound much more pleasant. I'll pray for a restful week, it sounds like she needs it. HUZZAH to her new friend! I think, in spite of all the health issues and recovery...you are doing great and she is also! Dont be so hard on yourself mama! Praying for peace to your heart and Amber's health! I know your blog is not technically a special needs blog, but I included it because I believe Amber's chronic health condition is a very real special need! Christy I love so much how you and Amber are making her health issues work no matter the odds. I know it has been a hard journey but you still have beautiful weeks full of wonderful things. I love the trip to the Apple Orchard. Keilee and I still play World of Warcraft for about an hour every day. It is VERY different from when I played with my gaming buddies but it is MUCH more fun!! Amber always looks so cute!! She reminds me of Keilee with the outfits she wears. I hope this week is finding things going smoother. Wish we were closer so the girls could hang out and we could sit and talk and talk!! Hugs friend! !